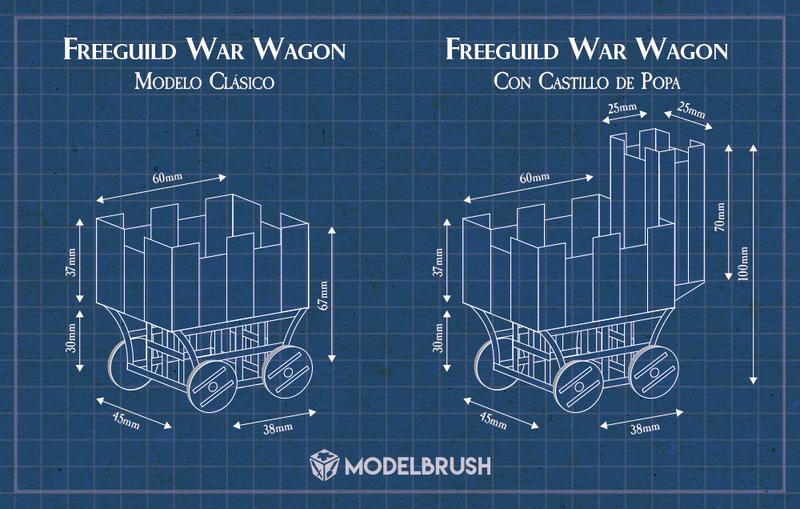 I'm planning to build my own Empire Freeguild War Wagon and the version Von Zeppel's Steam Tank. For the first project, I'm going to make a copy in resin of the original model (a friend has it in his box!!) and customize it with a little tower on the back ("stern castle") where I can place a Gunmaster or Battlemage. For the second project (Von Zeppel's Steam Tank) I will make the top platform for Steam Tank to put them the young engineers. Regards the rules, I found on other forum custom rules for Freeguild War Wagon, but I decided to remake them to add special rules for the "tower". However, I have not found anything about Von Zeppel's model. I show you my proposals! Sorry for my bad english, I have translated them but if anyone can help me to proofread them, you will become in my hero On the other hand, please, feel free to comment your opinions about the rules to improve them! A Von Zeppel's Steam tank is a single model. This land ship has a combat platform on the fuselage, from the crew arrives to the battle wielding a multitude of experimental weapons, such as Repeater Handgun, Hochland Long Rifle, Blunderbuss and close combat weapons such as Mancatcher, Ball and chain or Swords. The Steam Tank itself uses its Crushing Wheels and Ironclad Bluk to grind its foes into paste. Citadel. When a Steam Tank cross enemy lines, the engineers on the top platform take advantage of its height to hit accurate blows. You can repeat any To Hit roll of Melee Weapons, except Crushing Wheels and Ironic Bulk, during the combat phase. Killing blow if you roll a 6 when rolling To Wound with the Mancatcher it inflicts a mortal wound rather than a normal wound. Steel Behemoth: After a Steam Tank completes a charge move, you may select an enemy unit within 1"; that unit suffers 1D3 mortal wounds. 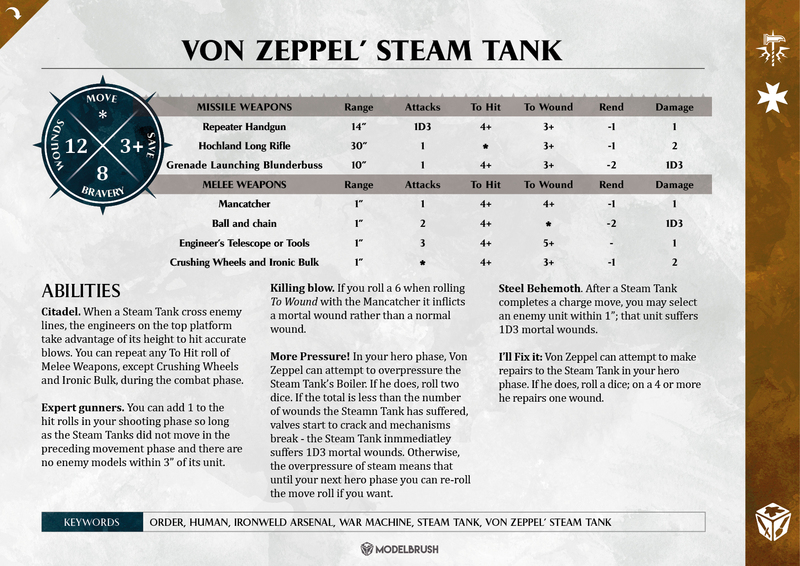 I'll Fix it: Von Zeppel can attempt to make repairs to the Steam Tank in your hero phase. If he does, roll a dice; on a 4 or more he repairs one wound. A War Wagon is a single model. It's a heavy carriage with an armoured battle castle pulled by two strong warhorses and a crew of six engineers equipped with a multitude of experimental weapons, such as Repeater Handgun, Hochland Long Rifle, Blunderbuss and close combat weapons such as Mancatcher, Ball and chain or Swords. The Steam Tank itself uses its Crushing Wheels and Ironclad Bluk to grind its foes into paste. Citadel. When a War Wagon cross enemy lines, the engineers on the top platform take advantage of its height to hit accurate blows. You can repeat any To Hit roll of Melee Weapons, except Warhorse’s Steel-shod Hooves, during the combat phase. Charge! : After a War Wagon completes a charge move, you may select an enemy unit within 1"; that unit suffers 1D3 mortal wounds. 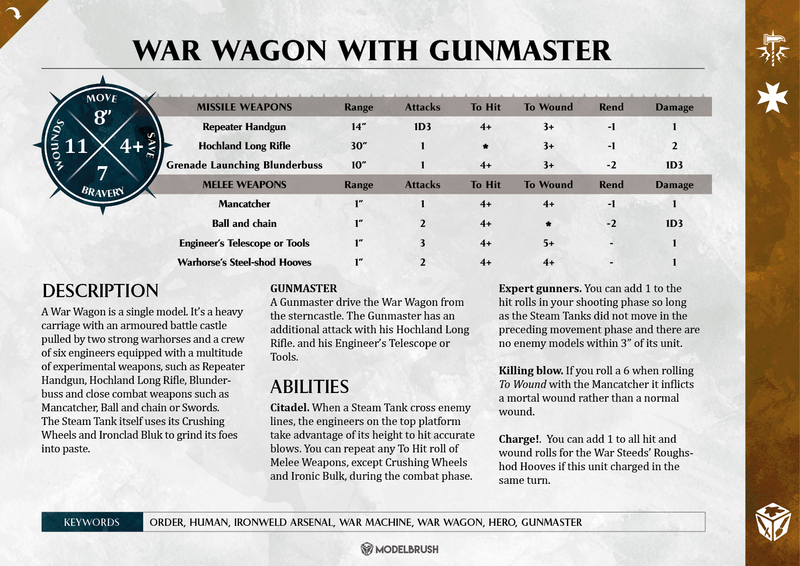 A Gunmaster drive the War Wagon from the sterncastle. The Gunmaster has an additional attack with his Hochland Long Rifle. 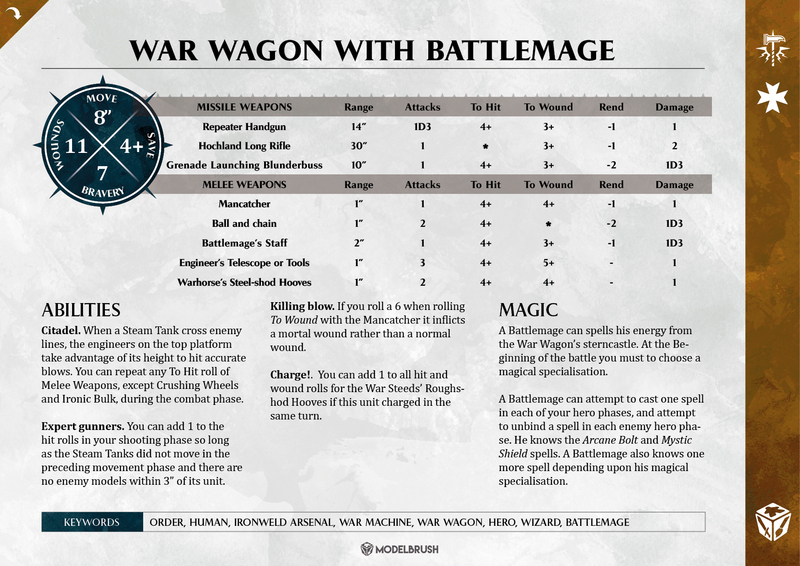 A Battlemage can spells his energy from the War Wagon's sterncastle. At the beginning of the battle you must to choose a magical specialisation. A Battlemage can attempt to cast one spell in each of your hero phases, and attempt to unbind a spell in each enemy hero phase. He knows the Arcane Bolt and Mystic Shield spells. A Battlemage also knows one more spell depending upon his magical specialisation. I certainly like the sounds of it! The model will look pretty sweet for sure. The rule seem good from my initial reading, but I'll have a deeper look later. However, i do have some comments on the warscrolls. I also think having "Steady Aim" which comes from the Handgunners warscroll might be a little too much, Only the Long rifle is from the Handgunner unit, and it could as easily have come from the Gunmaster who is Ironweld Arsenal. And you're missing the hook halberd weapon that was one of the original 6. The crew didn't really have a sword as an additional weapon. For the gunmaster version, you should include his pistols, and telescope or tools from the on foot warscroll. And for the Battlemage version, his staff should be a melee weapon not a missile weapon. It sounds ok. I have removed that rule because I see it refered mainly to the steam cannon and gun, but you're right, it would be good idea keep it only for the move. 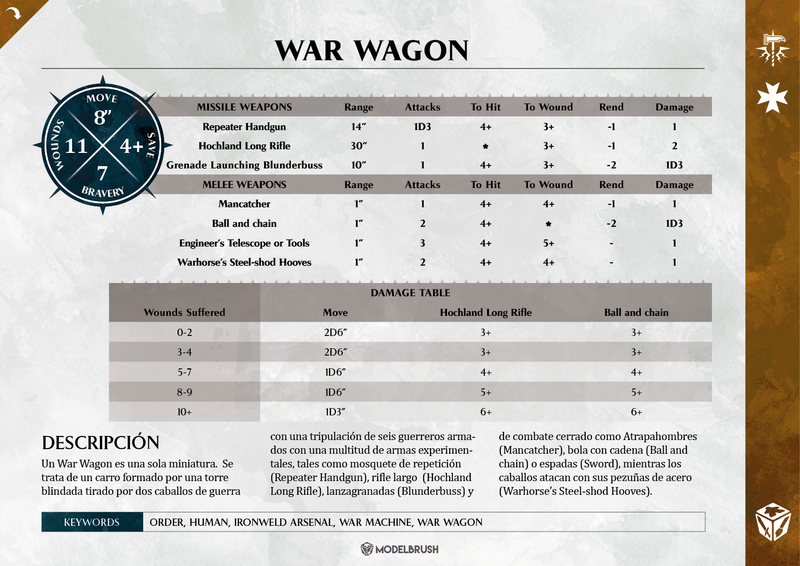 Regards the "wound table", I have ignored it because this "unit" has not any weapon itself, only the crew... the damage table usually has three columns (move + two weapons) and in a few cases there are some tables with only two columns (i'm talking about all AoS warscrolls). To keep this design, we could add the damage table using only the move column and another one for a weapon, but... what? missile weapons are from the crew, and the only weapon profile from the Steam Tank is the last one (wheels). If we keep the cost (280 points) we're losing the steam gun and cannon. We can preserve his power applying this rule. No, sorry I didn't explain it! I have not added that weapon because there are many rows in the warscrolls!!. I have summarized the melee weapons as a way to facilitate the use of this unit during the game. 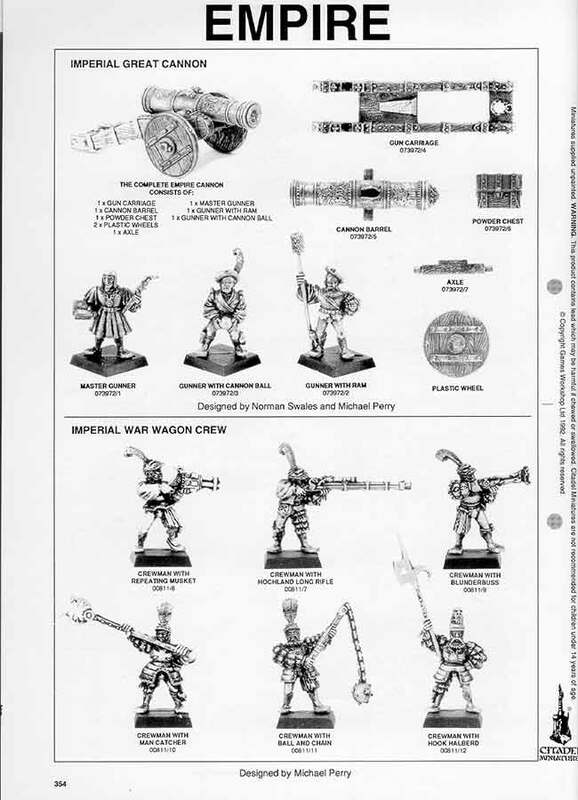 The War Wagons, i would have a look at the Hurricanum and War Altar warscrolls. So it maybe perhaps goes up to 11 wounds and is a Behemoth, so it would gain a wound table - if only for the movement. Looking at the Hurricnaum, Gunmaster and Hurricanum, I'd probably say it should be bravery 6. Again, the Hook Halberd should be there instead of the sword in the melee weapons. Again, I dind't explain why I decided the rules! sorry (you can check them in my blog http://modelbrush.com/war-wargon-von-zeppels-steamtank-ageofsigmar/). I decided to assign 9 wounds representing the maximum whole crew in the three versions of War Wagon (6 warriors and gunmaster/battlemage + two horses). Bravery is 7 because they are protected by an armoured vehicle! Regard the Halberd, as we talked, I have reduced it as sword to speed up the game. charged in the same turn. " The war wagon is not a normal chariot, is bigger and heavier! Yeps, I thought that, but if we make that, the number of rows in the warscroll will be elevated. To summarized it, I have decided to only add an attack to Hochland Long Rifle. Thanks you VERY MUCH for your time to read and comment your opinions! - Von Zeppel's Steam Tank get again the rule "more pressure!" only for the MOVE. - Von Zeppel's Steam Tank now has damage table. Finally I have left three columns: Move, Hochland Long Rifle and the Wheels. - War Wagon "Charge!" rule changed to the Chaos Chariots (re-roll to hit when it charges). I agree the Chaos Chariot is probably closest to what this would do on the charge. I do realise there will be many lines of weapons on the warscoll, if the Hook Halberd is on there, but it should be better than a sword. A normal halberd is s 4+, 4+ -1 1D. If there was a CAVALRY keyword, i'd also give it bonus of maybe re-roll 1's to wound against CAVALRY, but there isn't a keyword for the unit type for infantry, cavalry etc. I suppose you could give the Halberd the same profile and effect as the ball and chain to make it simpler. I do get the reason for missing simplifying though, to not have as many weapon profiles, but the Arkanaut Ironclad for the Karadron Overloads has a lot of them, so it's not like there aren't other examples out there. Instead of taking "Steady Aim" from the freeguild handgunners warscroll, use the "Expert Gunners" from the Freeguild Outriders warscroll. 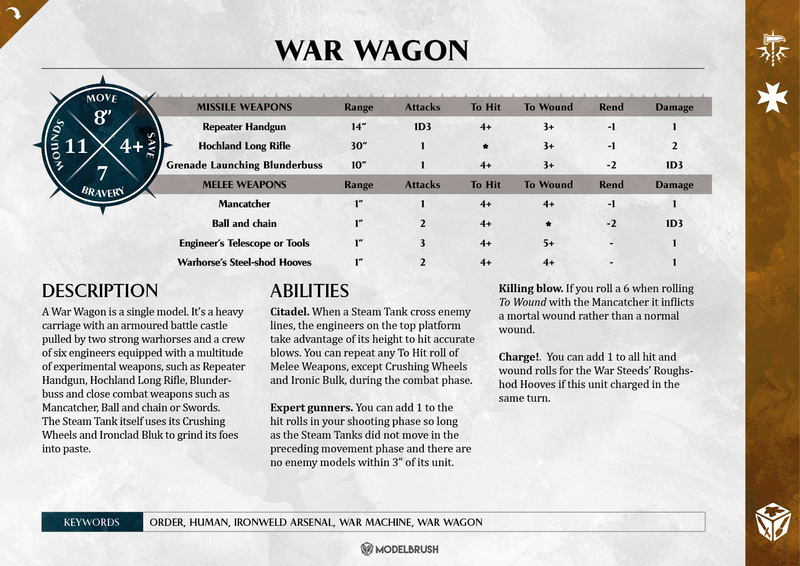 In the old 4th ed of WFB Outriders were minor engineers with experimental weapons like the repeater guns, and the crew of the war wagon would be the same thing - low rank engineers /gunmasters. It's essentially the same rule anyway, but slightly more accurate to the background. The war wagon with gunmaster would have 2 shots with the long rifle anyway, As both he and one of the war wagon crew would have one. As for damage tables, most war machines only have 2 columns instead of 3. I can't find any other examples with just 1, but I haven't checked that many. I don't think it would be a problem if it just affected the movement of the Von Zeppel or the war wagons. After all that i've said, if you're happy with it, and so is your opponent, that's all that matters in the end. I'm only putting suggestions. I suppose you could give the Halberd the same profile and effect as the ball and chain to make it simpler. I agree with this solution, although the rules for ball with chain are stronger!! I don't think there should be any swords on the attack profile though, none of the old models had one. Perhaps's call it Engineer’s Telescope or Tools, as per the gunmaster, and it would be 3 attacks (4 with a gunmaster), as 3 of the crew would use the special melee weapons instead. Humm, it sounds good too!! The profile of Engineer’s Telescope or Tools is very similar than swords, so we only need change the name and to hit/to wond. As you mentioned, in the sterncastle version with gunmaster, easily we increase attacks in +1 or type in description that he has an extra attack in melee weapon, exactly equal than with Long Rifle. Indeed, he has two attacks! Usually in AoS warscrolls when the unit has a “leader” or “captain” with extra attack, it is not refered in the profile, only in description: “GUNMASTER. A Gunmaster drive the War Wagon from the sterncastle. The Gunmaster has an additional attack with his Hochland Long Rifle.”. I have kept this kind of design. I can say you that there is not any damage table with only one column and 90% of them have three columns (I’ve re-designed in PDF warscrolls for ALL factions except Idoneth, Dark elves and Dispossessed). The only “tables” with one column are from warmachines and crew’s warscrolls, but the shape of the table is different. At this point maybe we can increase wounds and give it the damage table, but I think that an armoured warmachine should increase the bravery of the troops inside. Gunmaster (engineer) has Bravery 6 and Handgunner only 5. I think that it’s good leave it as 7 (the crew are young engineers, not handgunners). On the other hand, to “adjust” the power of war wagons, we can change in damage table the third column to modify the roll To-Wound of Ball with chain. Again, THANKS YOU FOR your interest and excellent contributions!! Please, I would like to add you in acknowledgement in our blog for these warscrolls, could use I your nickname for that? You're welcome, and yeah, that's fine. I have updated the warscrolls we last changes and I have built the english version (if you detect any error, please, contact me!). I will follow this thread with interest, since War Wagons and Steam Tanks are some of my favorite Empire units of all time. I'm enjoying it as well! Plus I think it's a good way to go about building war scrolls for other older models. Oxycutor had a great run down on the rules and balance I think. I've got nothing else to really add and bow down to the experts.